Believe it or not, but this photo is a page of our navigation system…. around Europe when we are travelling by car. It’s full of fold out maps and we love using it. Old School all the way baby! We just love using maps to get around. And when in a new city, what’s better than a map? I mean, even Dora the Explorer can’t go anywhere without her trusty friend Map…. I love actually reading the signs on the road. Connecting them with the lines on the map. 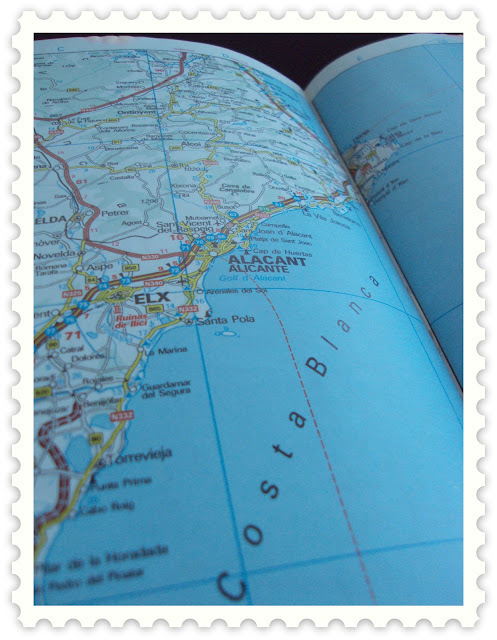 Even on a daily basis to find a nearby town or an unknown street, I use a map. My handy dandy Street Book. You need a street, it’s right there, waiting for me to find it. You see, navigation systems use The Voice Lady…..
She comes in many accents and I truly find her annoying. I always have a discussion with The Voice Lady…..
(“which exit? this one? Oh crap! Just great! They changed the roads! You didn’t know this?! Honestly, it’s better for my health and sanity if I just use a map…. Some good old fashion common sense, sprinkled with a bit of adventure, I tell you…. it’s a great way to travel or to just find your way around town! And yes, it might cause some discussions with your other half…. I know…. never a dull moment if you use the combination Maureen and a map…. Although sometimes we do use The Voice Lady. Last year, when we went to the UK in December we did use her service. We were so limited on time, we wanted to get from A to B quickly (his words). and enjoying the journey, because that’s what it’s all about, enjoying the journey. for a lot of people unthinkable. It’s just that I like a bit of adventure, getting lost and finding something else instead. Many times we have found a lovely hotel or another great beach and we were happy we’ve got lost. He can’t help himself, he is a man and they like to get somewhere quick I suppose…. find myself a map of the town, because this country isn’t in Europe…. I am SO with you Maureen! I’ve always and remain in love with maps. Enjoy the travels! En wat de kaart betreft: zo hebben wij ook onze nieuwe woonomgeving leren kennen, de beste manier vind ik. En heerlijk, dat navigeren, ik beleef er echt plezier aan! Enjoy your travels, great post. We have always been great believers in maps until while on our last trip to the UK and some unknown destinations ahead of us, we decide to succumb to a Tom Tom. To our surprise we are actually enjoying the novelty and I am delighted not to have to try and read a map while in motion! Hi nice to meet you. Jody here, came through Kasey Buick, I ‘m a huge fan of maps, though I can never ever follow them (and neither can my husband) All part of the chaos of our lives. Enjoy your trip! You know, real maps are great for planning trips too. You just can’t see everything the way you need to using Google Maps, MapQuest, etc. I do like a navigation system, but I think it works best when you use it together with a map. Plus they’re pretty. I use old school maps too…it just seems like more of an adventure that way. Have a great trip! Do you know, much to my 10 year old sons’ disgust, neither my husband nor I have EVER had a navigation system either! We have always relied on good old fashioned maps, and to be honest – I can’t see that changing anytime soon. I like to actually ‘see’ where I’m going with the good old fashioned finger on paper technique – and it’s taken me through Europe and parts of America. My son thinks that I was created with the Dinosaurs! I love maps too, but when I’m travelling alone the sat nav voice is so much easier. When I went to visit my parents last I had to laugh as they had the sat nav going and my mum had the map on her lap repeating and sometimes disagreeing with the voice! It was a recipe for many a fall out! Most guys hate maps but I love them. If it wasn’t for maps I’d get lost in my own house. All joking aside sometimes guys need to stop pretending to be super memory men and just read the map.